Is Cutter Backyard Spray Safe for Pets? Dogs are a part of our family – their lives are in our hands and it is important that we do all we can in order to protect them. Correct? As a dog owner, I feel the same way – before I use any product around my dogs, I make sure I take time to research and learn all about the product. Most importantly, I want to know if it is safe to use around pets, and if it’s not, I avoid it. During the summer months, I discovered a little product called Cutter Backyard Bug Control – people use it to get rid of mosquitoes and those annoying insects that do nothing more than well …annoy you. When I discovered this spray, I read many reviews on it. I loved hearing that Cutter Backyard Spray could control for up to 4 weeks and if it rains, it doesn’t wash the spray away. I also enjoyed the fact that it was easy to use – all you have to do is connect it to a hose and start spraying. However, my main concern was – is it safe for pets? From what I have discovered (I even took the time to talk to a veterinarian about it), it is safe for your dog, but you shouldn’t let them out right after you have sprayed it. After you have sprayed Cutter, give it at least 24 hours before you let your dogs out in your yard. Cutter contains 0.16 percent Lambda-Cyhalothrin. This is an organic compound that is commonly found in pesticides. It’s a pyrethroid, which is a class of synthetic insecticides that act as the insecticidal properties and structure of the natural insecticide called pyrethrin – this comes from chrysanthemums and other flowers. This particular pyrethroid is moderately toxic when a dog ingests it. However, it is quickly metabolized by dogs, so it shouldn’t affect them in the long run. Of course, digesting it is going to cause gastrointestinal distress. So, long story short, it is best that you avoid letting your dogs run around outside after you have sprayed this pesticide. Give the pesticide time to settle (24 hours should be enough time) before you let them out. Being a dog owner, when I hear the term “it’s almost summer time,” I immediately think about my dogs because I know what the season is all about – it’s about fleas, it’s about mosquitoes and it’s about ticks. Yes, those summer months are the months we tend to worry the most about our dogs because fleas, ticks and mosquitoes can be harmful to them. Take something as small as a mosquito (they’re so tiny, making them look harmless, but you shouldn’t let that small body fool you) – when it bites your dog, it can transmit diseases like West Nile and heartworm – they are nasty little insects. Have you ever looked at one of those jokers close up? They’re scary – definitely not something you’d want to bite you or your dog. I have learned that it isn’t possible to put my dogs inside of a plastic bubble to keep them safe (not that I have tried, but you know what I mean), and for this reason, I have been trying to find a method that will help prevent pesky insects from snacking on my dogs. Mind you, there’s insect repellent, but while it is fine to spray it on your own skin, this isn’t something that you should be spraying on a dog because it is toxic to them. Deet is an ingredient that is found in most bug sprays and it can cause skin irritation, vomiting and seizures in dogs, so it should be avoided at all costs. So since you cannot physically spray insect repellent on your four-legged furry friend before they go on an outdoor adventure, it would be best that you take care of the problem outside altogether – this involves using Cutter Backyard Control – it gets rid of those insects so that they will leave your pet alone. 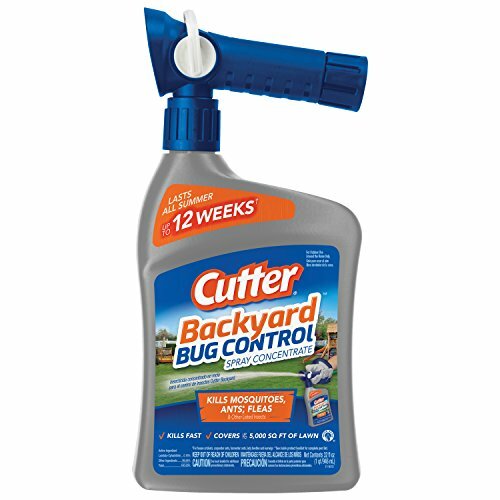 I recommend Cutter Backyard Spray, especially if you live in areas that are prone to mosquitoes and ticks because those insects can really wreck havoc on a dogs health. Cutter Backyard Spray, when used properly is safe for dogs as long as you do not let them run around in the yard right after you have sprayed and you do not let them eat the foliage in your yard.